Website Search Engine Optimization is a huge part of our website design plan. We can also help you with cost effective search engine optimization (SEO), and a pay per click (PPC) program plans. By properly structuring your Meta tags, keyword content, page titles, and many other aspects of your web pages we can obtain solid results in top search engines like Google, Bing and Yahoo. All Seattle Web Design develops web pages that are fully search engine optimized (SEO) so your website will be ready to promote from the very begining. SEO comes standard with all of our website design projects - it's not extra like many other website design firms. A properly search engine optimized website is the single most important thing you can do to get the most out of the free natural search engine traffic that your website should be receiving. Below are just a few of our Seattle SEO clients for you to review just how they do in natural search over a set time working with our team. 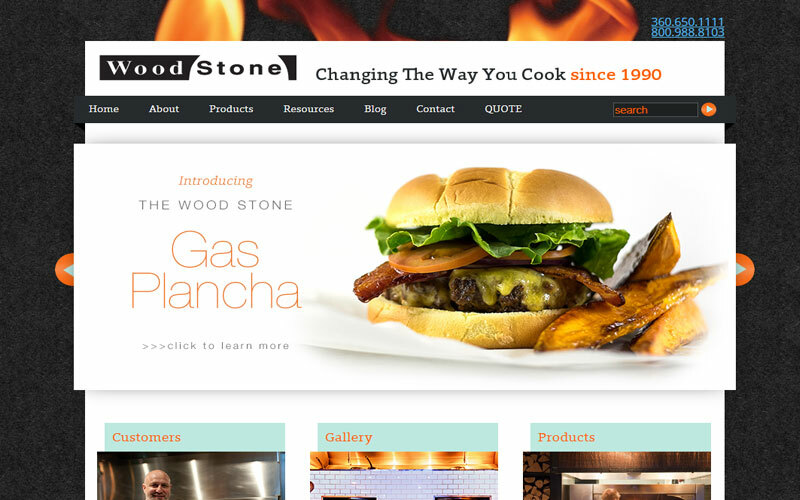 Wood Stone ovens of Bellingham is an International oven company with a large product line, an over 500 page website and is right in the middle of a very competitive market directly and indirectly with their own competition and big box stores such as Costco and Wall Mart. Over the span of our first year with the website we measured a 9% increase in all search engine traffic year over year - with over a 25% increase in organic Google traffic to the website was also measured. "We have been working with All Seattle Web Design since 2006. With the internet protocols constantly changing, we wanted to work with a consultant who could keep us on top when it came to search results and social media. We plan to continue working with them for many years to come as we have learned firsthand the value of search engine optimization." eWood Art offers a unique line of make custom barrel art carvings, clocks and signs out of wine barrel heads and staves. Their products are hugely unique but also in a very competitive market with lots of competition and variations. In less than a year we have increased this website' rankings of over 15% of their top 120+ keyword terms to top 12 or better rankings. We have also increased there year over year Google natural search traffic by 48%. "Thank you ASWD for your very effective work. The gains in keyword rankings and organic visits are very encouraging – keep up the great work." Big Picture is a boutique 21 and over movie theater and event meeting space. This longstanding Seattle based business has a large following of loyal customers. The challenge was to rank over regular theaters while also marketing the overall 21 and over experience. Some of the terms we target for them is movie theater terms, meeting facility and event facility to name a few. 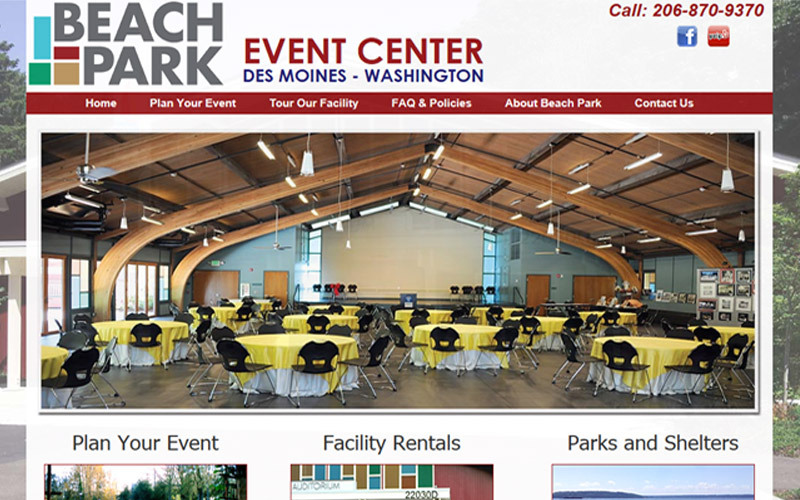 We redesigned the website for the historic Beach Park Event Center in Des Moines Washington knowing that there main goal would be increasing event bookings – especially weddings. We combined a stunning design with plenty of detailed event venue detail about all their unique venues, number of people, amenities, how to book and more. Combined with stunning photos, historic information and full Google account set up with Google Business, maps, analytics and more they tripled event bookings in their first year. For the Mayflower Park Hotel in Seattle we completed text and design upgrades in conjunction with a full Meta Tag (search engine information) upgrade and tracked this for 90 days. We tracked a list of the client's top desired keywords and terms for improvement in Google natural search as well as year over year metrics in their Google Analytics account. After 90 days we benchmarked the website at a 15% increase in visitors from all of the top search engines, year over year, and a 7% increase in natural search traffic directly from Google. Both resulting in more leads via the website's form, reservations and phone calls.